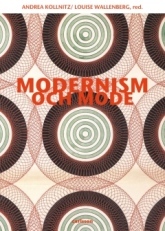 Andrea Kollnitz, fashion scholar and art-historian, and Louise Wallenberg, film- and fashion-scholar, at the Centre for Fashion studies are the editors of the book "Modernism och mode” on the aesthetic significance of fashion between 1900 and 1960. Collecting ten essays by Swedish and international researchers, the book discusses the strong and manifold impact of fashion on modernism and its different expressions during the period 1900-1960. "Modernism och mode” sheds light on topics such as modernist artists' fashionable self-performance, the role of fashion within Italian futurism and Russian constructivism, and modernist film as a total artwork. The book shows how fashion is connected to and promoted as art during modernism - a time when commercial fashion production is increasingly linked to mass production and mass consumption.